THE VIP CLUB - SIGN UP TODAY! Very special occasions demand an extra special make over….give yourself the Hollywood sparkle! When you simply have to look fabulous then airbrushing is the professionals' choice. 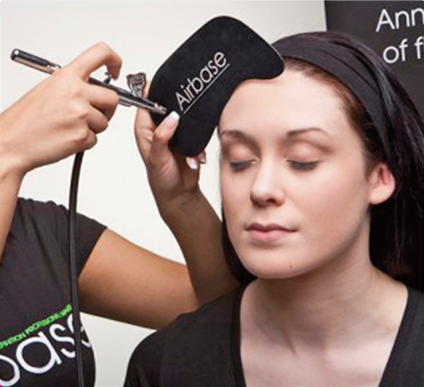 Airbase Airbrushing reduces the size of particles in the make-up when compared to conventional applications producing a less visible, more natural yet stunning look. Silicone based Airbase feels beautiful and luxurious on the skin by not clogging your pores, so allowing your skin to breathe. The remarkable combination of Vitamins A and E not only improves elasticity of the skin - so reducing fine lines - but moisturises to prevent skin aging.! The Beauty Chain offers a very safe, fast, convenient and cost effective way to build up a gradual tan before a holiday, special event or just to feel and look great. Our vertical tanning units use the latest in UV vertical tanning technology and equipped with efficient air cooling systems, fans and an emergency stop button. Our easy to use sunbeds are charged by the minute, with 3 minutes minimum and 15 minutes maximum in the sunbeds. If you are unsure how long to tan for, what kind of skin you have or what protection, accelerators, bronzers you would like to use to enhance your experience please ask a qualified member of staff before using the machines. Remember to keep an eye on our website and social feeds for those special bulk buy time offers ! You must be 18 to use a sunbed in the UK - please make sure you bring your ID with you if you're lucky enough to look younger than your age!